Flow cytometry is a method commonly used in clinical and research settings to examine the characteristics of biological cells. The bio-particles are guided one by one through a focused laser beam with sheath fluid and are characterized by fluorescence and light scattering. Currently, flow cytometers are large, expensive and often located in centralized laboratories. 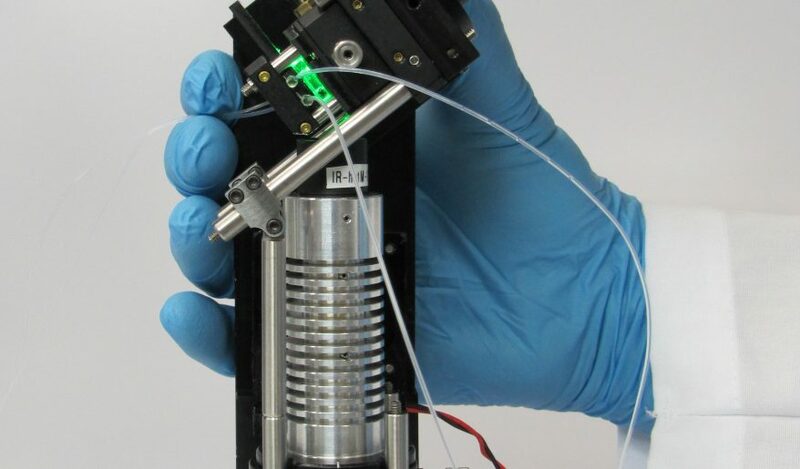 PARC’s “spatially modulated emission” technique enables a hand-held flow cytometer for high-performance onsite diagnostics at low cost, while maintain testing speed and high signal-to-noise discrimination. embedded patterned mask, which modulates the intensity of the fluorescent light directed to a large-area detector. A filter is placed between the channel and the detector to block the excitation light from being detected. The resulting signals are compared to expected particle signatures to obtain particle counts and analyte volume. With PARC’s technology, no complex alignment is necessary between the fluidic chip and the detector since a patterned mask is embedded in the fluidic chip. In addition, PARC’s unique correlation techniques allow high signal-to-noise discrimination without compromising the testing speed. PARC is interested in working with commercial partners who want to use our technology for new applications or products.